Researchers at Arizona State University, Tempe, AZ, have developed and successfully tested a novel exoskeleton device for the shoulder that could potentially assist patients recovering from injury. 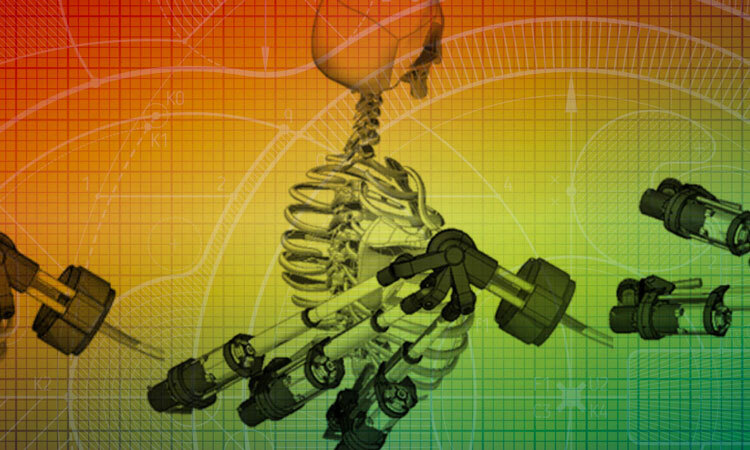 In their paper, ‘A Novel Shoulder Exoskeleton Robot Using Parallel Actuation and a Passive Slip Interface’, published in a recent issue of ASME’s Journal of Mechanisms and Robotics, the authors present a five degrees-of-freedom (DoF) low-inertia shoulder exoskeleton, comprised of two novel technologies. The first is a 3DoF spherical parallel manipulator (SPM), which was developed using a new method of parallel manipulator design. The method involves mechanically coupling certain DoF of each independently actuated linkage of the parallel manipulator in order to constrain the kinematics of the entire system. The second is a 2DoF passive slip interface used to couple the user’s upper arm to the SPM. This slip interface increases system mobility and prevents joint misalignment caused by the translational motion of the user’s glenohumeral joint from introducing mechanical interference. An experiment to validate the kinematics of the SPM was performed using motion capture. The results of this experiment validated the SPM’s forward and inverse kinematic solutions through an Euler angle comparison of the actual and command orientations. A computational slip model was created to quantify the passive slip interface response for different conditions of joint misalignment. In addition to offering a low-inertia solution for the rehabilitation or augmentation of the human shoulder, this device demonstrates a new method of motion coupling, which can be used to impose kinematic constraints on a wide variety of parallel architectures. Furthermore, the presented device demonstrates a passive slip interface that can be used with either parallel or serial robotic systems.